Weaving at Johnstons of Elgin. Picture by Gordon Lennox. Once upon a time the words “tweed” and “twee” were synonymous. Asked to picture who would wear a tweed jacket and most people would naturally imagine an old man sitting on the back pew of their church or a posh lady wrapped up in a tweed coat enjoying coffee and a scone at House of Bruar. Close the story book to look around and today’s truth couldn’t be further from the fair tale of yore. Celebrity fans of tweed include former Dr Who actor Matt Smith and wrapper Tinie Tempah, while brands from Marks & Spencer and Topman through to Converse shoes, Dr Martens boots and North Face jackets are queueing up to use the material in their ranges. One of the turning points for the Harris Tweed industry came in 2005 when Donald John MacKay won a contract to supply sports firm Nike with 10,000 metres of the material for its “Terminator” range of baseball caps. MacKay was later appointed as a member of the order of the British empire for his achievement. Harris tweed’s popularity has always waxed and waned; having been championed by avant-garde designer Vivienne Westwood during the 1980s, weavers left the trade during the 1990s as its lustre declined. Yet expanding into a broader range of export markets may just be helping the industry to remain on a more stable footing. “Traditionally, Harris tweed would have been primarily used for gents’ sports jackets in the autumn-winter season collections,” explains Lorna Macaulay, chief executive of the Harris Tweed Authority, the statutory body that oversees the industry. “Harris tweed is 100% wool and its application is now across apparel, accessories and interiors markets. “We recognise that servicing international markets in each of these discrete sub-sectors is vital to ensure year-round work for the island mills and weavers. The industry is today, as it has been for more than 60 years, primarily an export-based sector with some 60-70% of all Harris tweed exported. Tweed isn’t the only material that’s enjoying a resurgence. 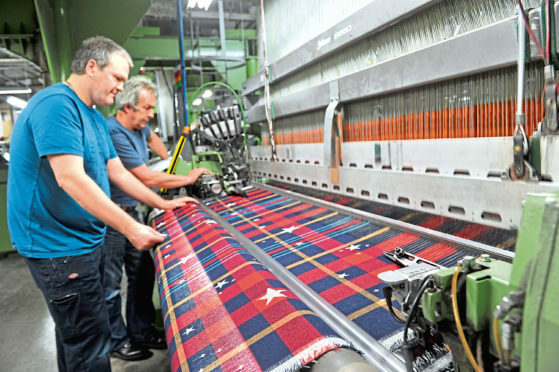 Cashmere specialist Johnstons of Elgin, which traces its roots back to 1797, is finding popularity in some unexpected places. “We were traditionally known as a cold weather brand – we’d sell well in the autumn in colder climates,” says chief executive Simon Cotton. “Some of our best growth has been in areas like the Middle East and South America recently and that’s because of the aggressive air conditioning and the fact that people want accessories to give them flexibility, so – when they’re moving from an air-conditioned restaurant to a warmer street – they want something they can put on and off very easily. “We’re finding that, where people would once buy a scarf to keep them warm in the winter, they’re now buying a larger accessory like a stole or a wrap, which gives them flexibility to go from hot to cold to hot to cold all the time. It’s a trend that’s really helpful and we feel we’re becoming truly international, whereas we were in specific geographies before. “We’ve taken the brand from being a category brand known for accessories – scarves and jumpers, etcetera – to now selling as a lifestyle concept, so you can come in and buy a complete outfit, including jackets and coats and trousers, so there’s a whole offer there. People are starting to see Johnstons in a different way now in export markets.” The company’s products are now on sale in 60 countries, using a network of agents and its own overseas offices to sell its garments to wholesalers. Cotton is open to franchising the brand, although he has no plans at present. Exports account for nearly half of the company’s own-brand products and about 25% of its private label work. Total turnover was £74m last year, up slightly on the previous 12 months. Cotton points out that exporting also brings benefits to the wider community, with many of his best staff in London and Paris having started their careers in the firm’s mill shop in Elgin. The same wider benefits are also enjoyed on the Western Isles. “Harris Tweed provides employment for approximately 400 people here in Lewis and Harris, often in the most rural and fragile parts of the island,” says Macaulay. She points out that the industry also adds £12m of gross value to the Scottish economy each year. Oliver points to the advice, information and finance available from HIE and SDI to help companies in the fashion and textiles sector – and, indeed, other parts of the economy – to begin trading overseas. In particularly, she’s getting excited about the XpoNorth creative industries festival taking place in Inverness on June 27 and 28, which will include panel sessions for exporters to share their experiences and input from other support organisations like Creative Scotland, Scottish Textiles and UK Fashion & Textiles. “Regardless of sector, exporting should grow the customer base for a business, improve turnover and contribute towards profitability,” she adds.